On Saturday 3rd December 2016 the town of Seaford lit up when Christmas Magic returned! 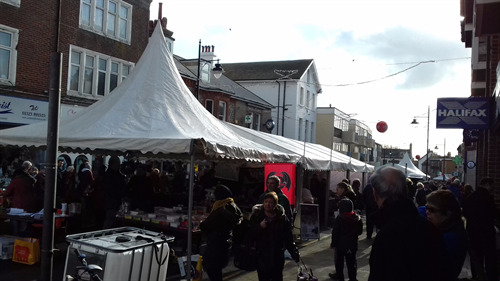 Organised by Seaford Town Council and Seaford Christmas Magic Events Committee, the Town Centre was filled with the sights and smells of Christmas for all to enjoy. The event was kindly sponsored by many businesses and organisations in and around Seaford; and couldn’t have happened without their support. 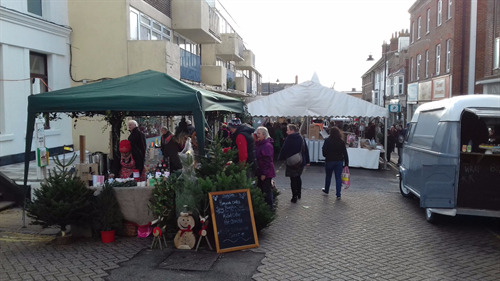 There were over 60 stalls providing a vast array of produce, with charity and fundraising stalls, Christmas trees, hog roast, mulled wine and a variety of exclusive Christmas goodies; there was something for everyone! Feedback from stall holders was very positive with stall holders stating the event was “extremely well organised” and local town traders “Saturday was fabulous and the best turnover since the event started”. 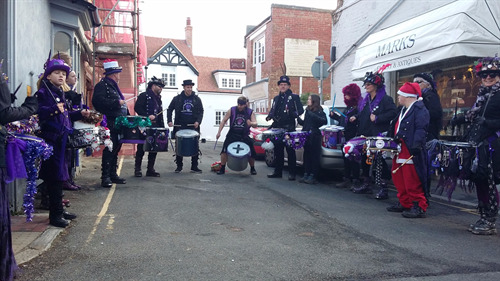 Seaford saw 3 stages with live entertainment all day, which was enjoyed by the crowds who gathered throughout the day to come and support their local talent. Performances were given by Seaford Choral, Mel, Megan Rose Fry, Chaz ‘n’ Das, Harry Kirzynowski, Consensus Choir, Rosie, Up the Tempo, Sprung, Seaford School of Dance, Jennie Hallett, Over 60’s, Jez, Seaford Musical Theatre, Archway Choir, Seaford Silver Band, Juggletastic, Stix and Funk Band. The lantern Parade was a magical experience for the families and children who took part and for the bystanders who shared in the joyous atmosphere of the parade. Lantern making in St. Leonard’s Church Hall was made possible by Kristina Veasey, sponsored by Phil Boorman, Sparkle Glass and Sussex Eyecare. Hundreds created their own individual lantern and took part in the festive lantern parade throughout the town. 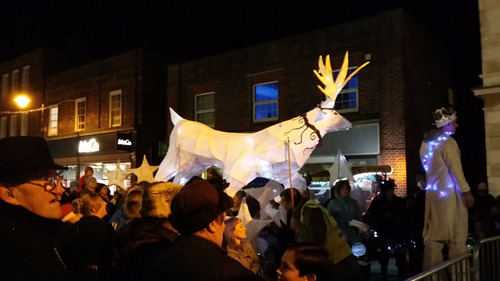 Seaford Town Council would like to thank Seaford Rotary who transported Santa on his sleigh, and lead the lantern parade through the town. Santa ended his day with the switching on of the amazing Town Centre lights with hundreds of people drinking in the magical atmosphere. Seaford Library and Seaford Community Cinema also joined in the day and entertained visitors with story times at the Library and the movie The BFG shown at Seaford Cinema. Seaford Town Council and the Seaford Christmas Magic team would also like to thank the following businesses for their support and sponsorship to the days celebrations; Andy Anderson & Son Locks Smith, Shoreline Accountants, Sussex Markets, VR Flowers and Sons, Holy Cow, Stem & Petal, Stitch of Broad Street, Intersport, Sussex Mobility Scooters, SAS Security, Fonetastic Tea Rooms, Sparkle Glass, Reid Briggs Insurance Brokers, Sussex Tile Centre, Wynnes & Seaford Fencing, Premier Travel, Simon Welch, Clare Davis Travel Counsellor, Madison Web Solutions, Newhaven Base Point, Badger Inks, Fonetastic, Phil Boorman House Clearance, Seaford Home Hardware, Wynnes, Sussex Eyecare, Toytown, Rathfinny, Barwells, Seaford Health Store and Horder Healthcare. Phoenix Security supported the event this year with exceptional first aid cover for first aid throughout the day. Sussex Events Ltd were key players on the day and must be thanked for their continued professional service and contributions in making this year’s event run smoothly. We hope you all enjoyed a magical and festive experience, and collectively thank the Seaford Christmas Magic Committee, without whom the event would not have happened: Greg Anderson, Carol Edwards, Jonathan Chappell, Adam Briggs, Phil Boorman, Dave Argent, Kristina Veasey, and Daeron McGee. To all who volunteered their time and efforts to ensure that this event was a success, Seaford Town Council would like to give their warm thanks and a huge well done.